VW's lab will be staffed by 100 designers, engineers and psychologists -- and the company is still hiring. 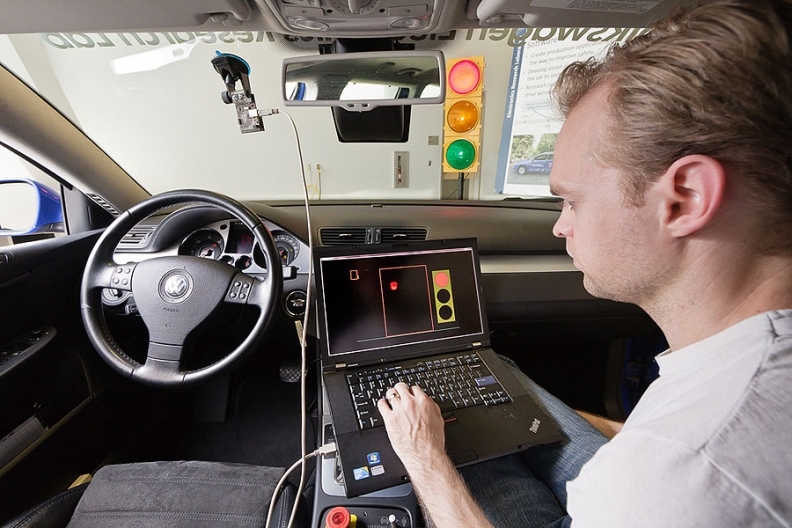 SAN FRANCISCO -- With the battle for advancing automotive telematics heating up -- along with pressure for reducing driver distraction -- Volkswagen opened its larger Electronics Research Laboratory here. The facility, with a $20 million annual budget, will focus on the areas of driver assistance, human-machine interface, multimedia and connected vehicles, said Burkhard Huhnke, executive director of the lab. The lab will be staffed by 100 designers, engineers and psychologists, and VW is still hiring. VW first started this type of work in Silicon Valley in 1998 in Sunnyvale with three staffers, and grew to a larger building in Palo Alto. But the new Belmont facility is VW's largest research unit outside of Germany, Huhnke said at a press event last Friday. The location is key in luring the best talent, not only poaching from Silicon Valley software firms, but also in hiring recent graduates from Stanford and the University of California campuses at Berkeley and Davis. A car that can navigate itself through a parking structure to find a parking place, and return to the structure's entrance when summoned by the driver's smart phone. Sensor systems that can "see" an object in three dimensions. Currently the size of a coffee can, the whirling sensor is to shrink to the size of a packet of cigarettes. Driving awareness systems that detect traffic-signal and speed limit changes and can accelerate or decelerate the car as conditions warrant. A car monitor that tracks driving patterns that can be uploaded to a smart phone or computer, allowing a driver to make more efficient driving decisions in his commute. Improving the readability of the instrument panel, using fiberoptics to stack multiple readouts within the same cluster without becoming confusing. An example would be to have the next step of a navigation instruction nestled inside the circle of the speedometer readout. Making the human-machine interface more elegant, using haptic clicks and an intelligent mouse so navigating telematic menus is more predictable. Using Google Earth as a navigation aid, including using "street view" so that a driver knows what the destination looks like, not just its address. This might be expanded to proactively show nearby electric vehicle charging stations if the vehicle knows it is running low on a charge. "This is not about eye candy," said Rob Csongor, Nvidia vice president of corporate marketing. "We take technology and apply it to problems in society." A center console that can wirelessly charge smart phones, similar to "power mats" now on the market for home use. The project, in development with Qualcomm, could use magnetic near-field resonance to power rear-seat entertainment or ambient lighting systems as well. For those who must have the coolest accessories, Audi is developing floormats where the car's logo is illuminated. Making sure the electronics don't short out when stomped on by snowy or wet boots is a big hurdle. Remember the "Fast," the malevolent little critter from the VW ads that subconsciously urged drivers to drive with more zest? VW is creating an interactive version that can communicate with the driver, as well as with other nearby VW drivers as a social network beacon. And those were just the programs that VW was comfortable showing journalists on a tour of the facility. In an interview, Volkswagen Group of America CEO Jonathan Browning discussed customizing a vehicle's settings based on which occupant's smart phone was activated inside the car. When asked if that program was being developed, Browning smiled and said, "We don't always show you everything."